Find My Workspace lists over 95% of the serviced offices market in Al Zafranah. Simply click Request Quote to check pricing for one office, or Add to Basket for multiple offices. 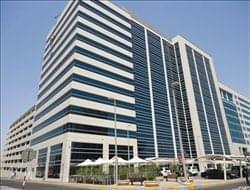 5 Star serviced offices located on the 4th floor this business centre, located away from the increasingly congested area of Abu Dhabi and towards the more up market residential areas, where many government offices, ministries and international companies are based. The spacious offices offer a modern and prestigious environment for your business with a hint of culture due to the Arabesque designs on the office glass and the original black and white photos of the UAE. To obtain information for your selected Al Zafranah Serviced Offices, please tick the "Add to basket" box for each office you prefer and complete the form below. We will then send a detailed report via email.